Each story panel features photographs of a particular location, some background about the place name, and a satellite view from above or a street-view. 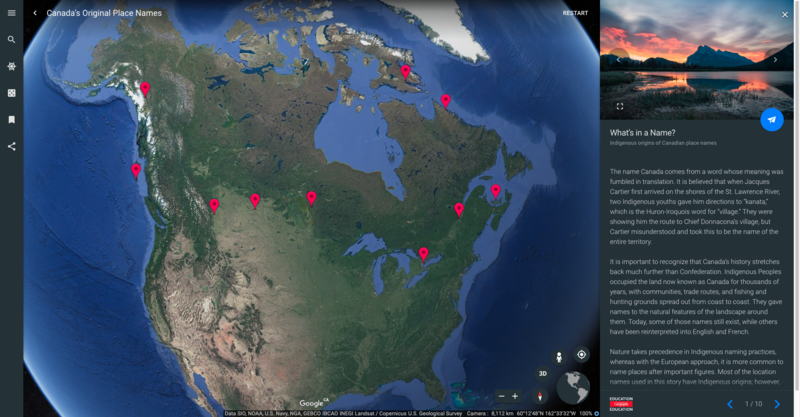 The answers to these questions can be found in Canadian Geographic Education’s latest Google Earth Voyager story, Canada’s Original Place Names. The story looks at how Indigenous Peoples across Canada have given names to natural landmarks or to places with which they have strong spiritual connections. This is Can Geo Education’s third Google Earth Voyager story in a series that has previously examined the dark history of residential schools and featured the work of world-renowned underwater explorer Jill Heinerth. Toponymy is the study of place names and their origins. In this Google Earth Voyager story, stunning satellite images, street views, and photographs are combined with historical and cultural information about different cities and places in Canada. Indigenous Peoples have occupied the land now known as Canada for thousands of years before Europeans arrived. Many of the place names used in this story have Indigenous origins and have retained something of their original names, but others have been reinterpreted into English and French or changed entirely. This story touches on the place names that still exist, those that have been changed, and those that have been reclaimed. The locations selected for this story only skim the surface of Canada’s toponomy, but they can start a conversation about how place names change over time, as well as the broader context of Indigenous history in Canada. Can Geo Education encourages teachers to use this resource to inspire discussions about naming practices and Indigenous perspectives.